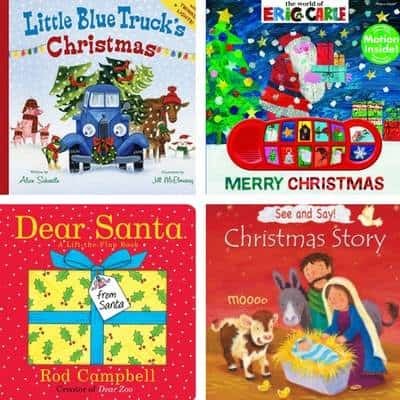 Are you looking for some of the best toddler Christmas books? 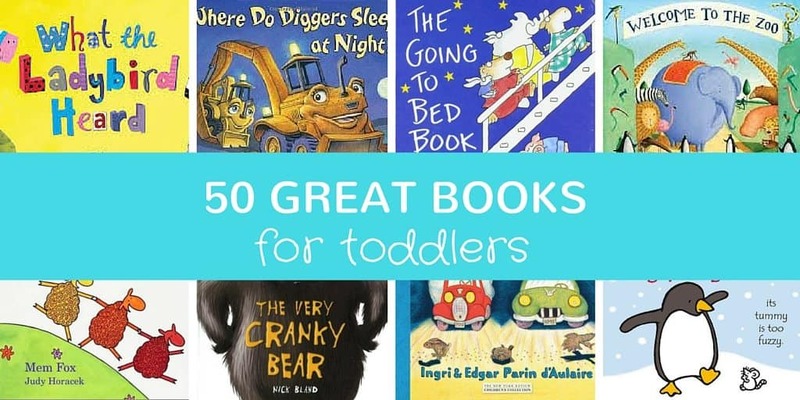 Earlier this year we put out a list of 50 Great Books for Toddlers and it has been one of our most popular posts. 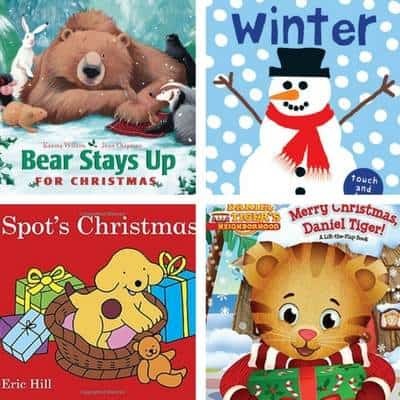 Christmas is a time where I love reading themed books and there are so many great ones to choose from. I was the person at the library in September checking out all of the Christmas books to make sure that we came up with a great list. 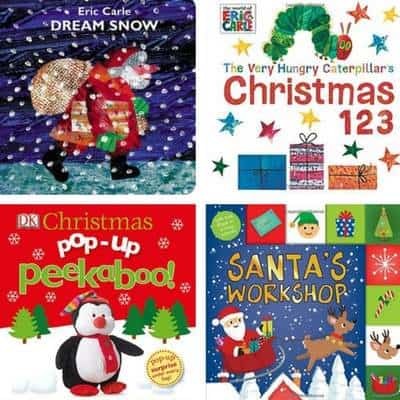 If you are thinking about gifts for toddlers these books would be great too. For ease or purchasing, clicking the links will take your directly to Amazon where you can buy them directly. If you’re not already an Amazon Prime member, it pays to join up as you get a 30 day free trial and free 2 day shipping (Christmas shopping here we come!). 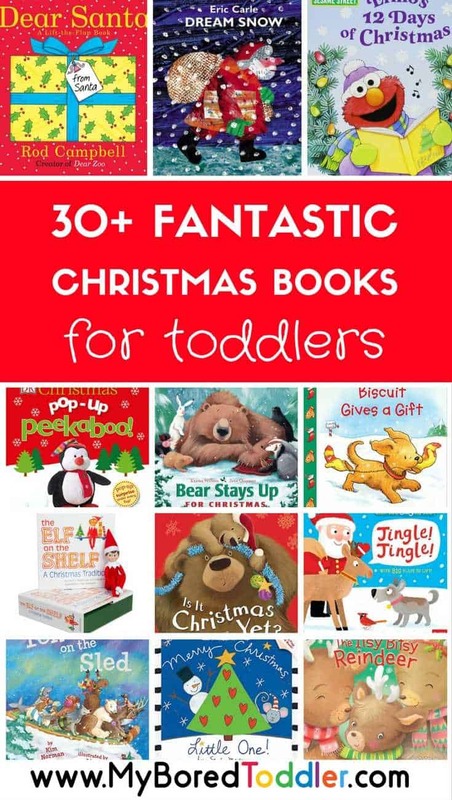 I’d love to know if there are any Christmas toddler books that think should be on the list. Let me know on Facebook, Instagram or Twitter. 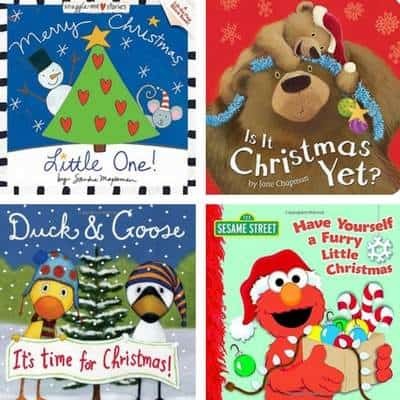 It seems only fitting to feature the Night Before Christmas as the first book in our best toddler Christmas books collection. This classic Christmas tale comes in a board book format, which is perfect for babies and toddlers. We love reading this book in the lead up to Christmas and I’m sure you will too. 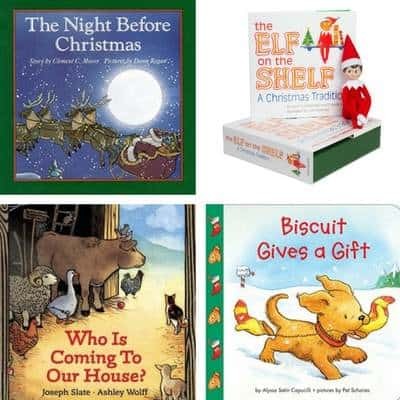 I think that by now everyone has heard of the Elf on the Shelf and there are so many great ideas that you can do with the elf from this story. It’s a lovely Christmas tradition to start (be aware that you need to commit to doing this each night though!). I also love that there are different types of elves available. This set comes with the Elf on the Shelf story and the Elf figurine toy. This story tells the traditional tale of Christmas through the eyes of the animals in a stable. Joseph Slate writes beautiful stories and this is no exception. If you are looking for a more traditional Christmas story suitable for young children then this book is definitely worth a read. “Wake up sleepy puppy! It’s Christmas and we have lots to do!” If your children love the biscuit books as much as mine, then they’ll definitely love this Christmas version. It’s a favorite in our household at Christmas time. You will fall in love with this book. 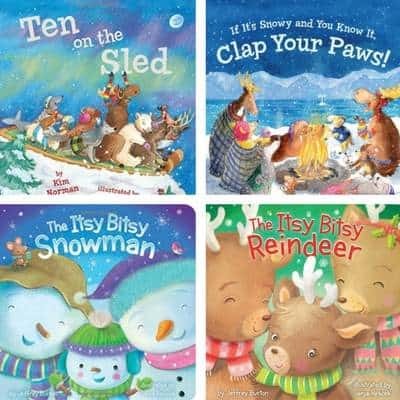 A good counting book is always a hit with toddlers, and this one features a reindeer, a caribou, a seal and many more animals on a sledding adventures. A great counting, singing, fun toddler book. Following on from the last singing and rhyming book, this book is also fantastic. Sung to the tune of ‘If you’re happy and you know it’, this book will easily become a favorite, with the kids reciting it over and over (trust me on this one!). A great fun Christmas book. This is a perfect book for young children. It has beautiful illustrations, fun rhyming text and a lovely Christmas themed story. As a teacher loved reading this one to my younger students and my own children love it too. Sung to the tune of The Itsy Bitsy Spider, this lovable reindeer is spreading some Christmas cheer. This is another very catchy story book which will have you quickly singing the tune! This is a new release book, and one that is definitely worth looking at getting this year. It couldn’t be a toddler book list without a feature from Eric Carle. The author who brought you the very famous, The Very Hungry Caterpillar, has a lovely Christmas story called Dream Snow. This one comes as a board book and is perfect for toddlers and young children. Ok, you didn’t think we could make it though this list without at least one feature from The Very Hungry Caterpillar did you? I’m pretty sure that most parents can recite the original version of this book word for word and I KNOW that all early years teachers can. The Christmas edition is a perfect addition to any book collection and there are so many great craft activities that you can do with this book too. This one comes a board book too. This story combines two of my toddler’s favorite things. Pop up books and peekaboo books. This is a great book for the younger children and will definitely keep them entertained. This is a fun Christmas lift the flap book with tabs which makes it perfect for little fingers to read. Anything where you can lift the flap makes it a hit with toddlers, but the story around this one is great too, with eight different holiday scenes to explore. If you have a young toddler or a baby then this book is perfect. It has a padded cover and sturdy lift the flaps making it hard to break. Each page has a beautiful rhyme and gorgeous illustrations. This book is another squishy board book with beautiful text and illustrations. Featuring a little bear and a big bear as they eagerly wait for Christmas. This is a really cute book! Brought to you by the New York Times best selling Author and Illustrator Tad Hills, you know this book is going to be good. It continues the Duck & Goose series and shares their adventures as they get ready for Christmas. This is a large board book. Of course Elmo and Sesame Street have to feature on this list. I’ve yet to meet a toddler who isn’t an Elmo fan, and this Christmas Elmo book will definitely impress. It has everything you would expect from a Sesame Street book and is a perfect toddler Christmas book. This book has five pages full of lift the flaps, with lots of Christmas words and pictures to find and say. This is a great book for developing those first words. 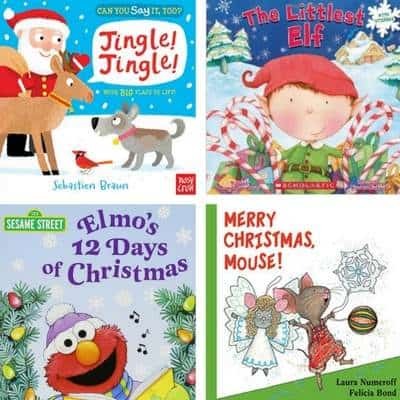 This is another Christmas book created by New York Times best selling authors and illustrators. It tells the story of the littlest elf in Santa’s workshop, and his adventures leading up to Christmas. It even comes with stickers! Yes, this is our second feature of Elmo in the list, but do you really blame me! There are many versions of the twelve days of Christmas, but I really love this one for toddlers. It features all your favorite Sesame Street characters too. If you love Give a Mouse a Cookie, then you’ll definitely love this Christmas version, where the mouse decorates the tree in a fun counting adventure. This was my favorite Christmas story last year. 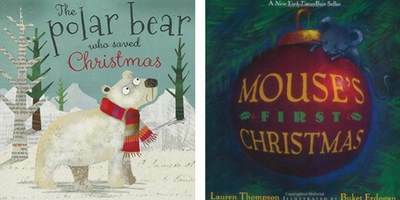 It is such a beautiful story about a bear whose friend’s are determined to keep him awake until Christmas. They make him do all kinds of fun Christmas activities to keep him awake! This book has lots of touch and feel components and beautiful bright images. It’s great for babies and young toddlers and would make a great gift for a first Christmas. I couldn’t finish this list without including a Spot book. It absolutely had to have a place in our Best Toddler Christmas Books list. The classic lift the flap book also comes in a Christmas version which is hugely popular in our house. If you have a Spot fan, then you need to get this book. There’s a reason this Little Blue Truck sequel is an Amazon Best Seller. This book encourages counting, as the little blue truck delivers Christmas trees to all of his animal friends. This is a must read story! This is the last Eric Carle book, I promise! This one has to make the list as it comes with moving pictures and sounds (and it’s from a great author!). This one is quite short and caters more for the younger toddlers with shorter attention spans. Written in the same format and by the same author as Dear Zoo this one is a must buy. Dear Zoo is one of our favorites, and the Christmas version is even better! Lots of lift the flap Christmas excitement in this book. 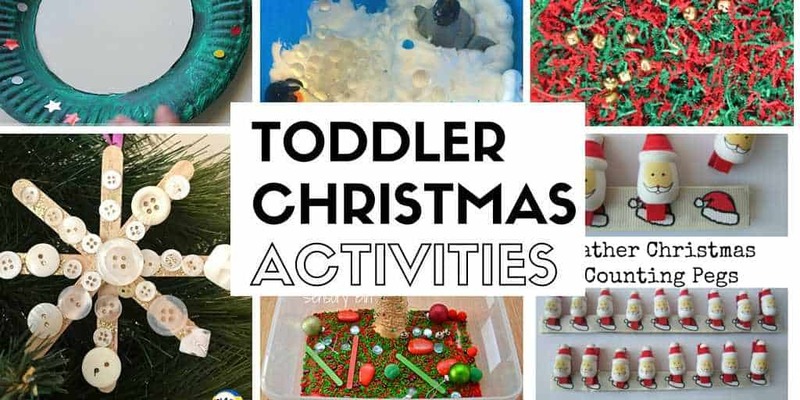 This is a fun version of the traditional Christmas story that the children can join in with. If you are looking for a traditional Christmas tale suitable for younger children then this is one you need to check out. I do love a good Polar Bear book and this one is no exception. This is a lovely bed time story read. One of Santa’s reindeer is missing and polar bear comes to the rescue. This is lovely simple rhyming book about a mouse exploring his first Christmas. A great book for the younger children. Watch the mouse discover all the sights and smells of Christmas. A beautiful read (and a great gift idea). « Palm Oil – What is it doing to our Children’s future? Great List of Books, thank you for sharing. I’m thoroughly enjoying the Autumn/Thanksgiving season right now, but still tucking away ideas for Christmas – I’m looking for ideas for our grandchildren, so this list of recommendations is perfect!